I acquired a 1982 Datsun 720 pickup, and there was too much slop in the idler arm. I wanted to replace it with a relatively robust unit. I ordered a Moog idler ($92), but when I opened the box, I found that although the mounting bracket is a nice, cast steel piece, the pivot itself doesn't appear to have much bearing surface to resist the typical wear that most idler arms exhibit (that is, the arm should not deflect up and down). Then I ordered a NAPA idler ($96), and when I unboxed it, it appears nearly identical to the one worn one I have, except that the NAPA unit has no grease zerk. 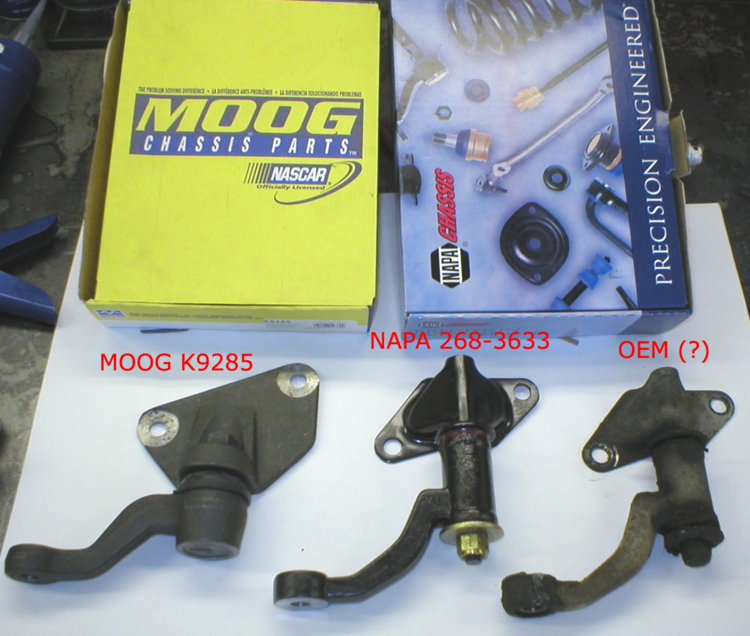 So, I kept the NAPA unit and returned the Moog. Then I took the NAPA unit apart and cross-drilled it for a grease zerk, and installed it on the PU. Seems to work nice. While I had it apart, I noticed that the bushings are of a type of plastic. I took the OEM (or, what I assume to be OEM) unit apart and it uses the same style of plastic bushings, though of a different color, and they were, of course, very worn and cracked. Both are about $8 each, so $16 for a pair. A lot cheaper than buying the whole idler arm, when the plastic bushings appear to be what take the brunt of the wear. I guess that I should also mention what is sure to come up: why not just fire up the lathe and machine a couple of metal flanged bushings? Bronze would be easy, and as long as the housing is greaseable, they'd probably outlast the plastic. Sure, I could do that, but one of the nice things that having bushings with some deflection ("give") provide is to allow severe shocks to not be entirely transmitted to the steering gear. Sometimes, it's nice to not beat up the rest of the steering bits. Got more pics and/or info? If you have some, email me.